Randel Johnson took his first work in 2008. 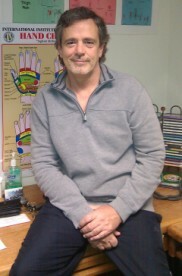 Randel found that Reflexology helped his many injuries. He found that Reflexology is very complimentary of his Massage and Wellness practice. Randel's back ground with being a Personal Trainer, Massage Therapist and his back ground selling fitness equipment didn't take him long to realize that Reflexology made a perfect fit to his background. The more he learned about Reflexology the stronger the drive to learn more and more about it. He knew once he started to take the workshops that he wanted to represent the I.I.R. in the very near future. To reach his goal he trained with several different instructors. Randel joined the I.I.R. family of instructors in 2010 teaching in the Chicago area, Arizona & New Mexico. Randel lives in Crystal Lake, IL with his family. When he is not teaching workshops he has a Reflexology, Massage and Wellness practice and enjoys spoiling his Grandkids and camping.